Ginger Sweet Potato Puffs make a delightful occasional dessert, suited for any crowd! Chop the Sweet Potato in to ½ inch chunks, put it in a pot, cover with water, and boil. While the sweet potato is cooking, dice the ginger finely, and add to the sweet potato. Let the pot boil down, stirring regularly, until there is no liquid left. Let it cool on the stove-top for at least 10 minutes, until the mash is below 90 degrees (the temperature of the pot should be comfortable to touch). Pre-heat the oven once the mash has boiled down and is cooling to 350 F.
Whisk and add the eggs to the Sweet Potato Mash and stir the eggs in to the sweet potato mash thoroughly. 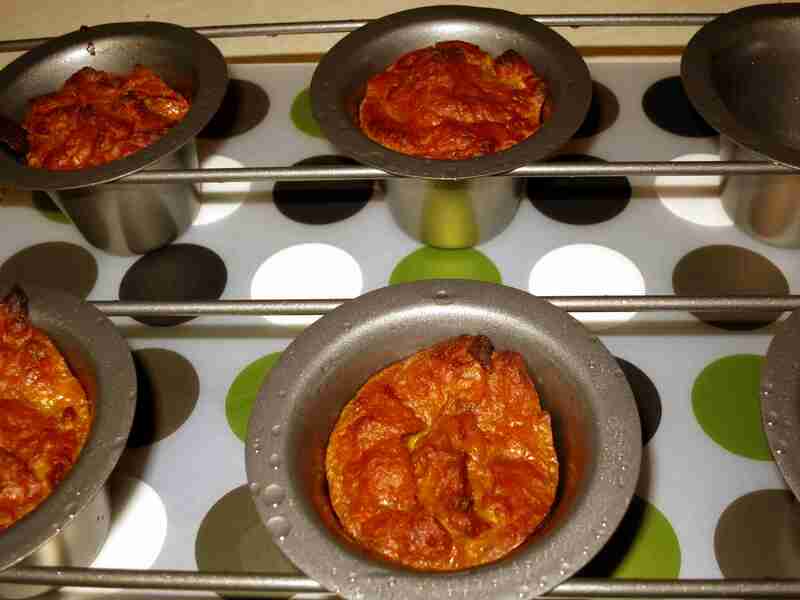 Using coconut oil, grease the muffin cups. Pour the final mixture in to the muffin tin. 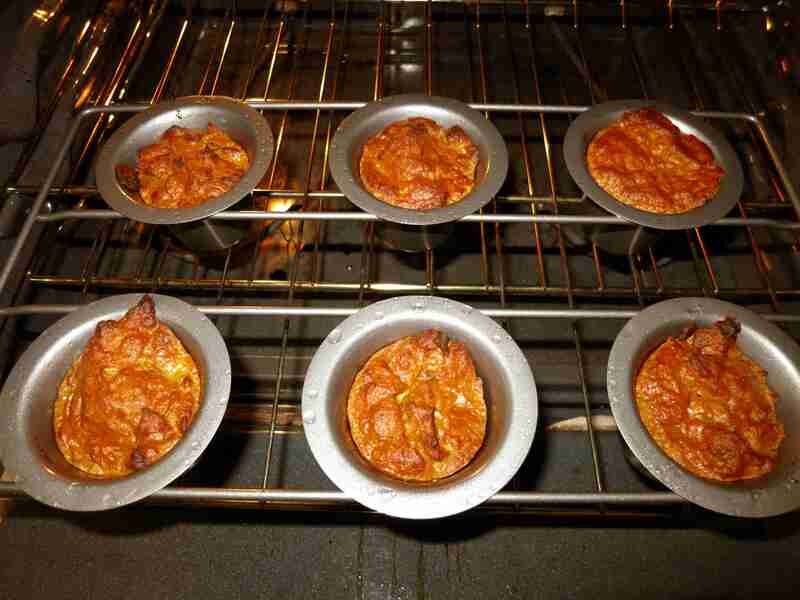 Put the tin on a middle-rack in the oven and bake for 90 minutes. These are best served hot - piping hot! As with other baked confections - this will need to be "lifted" out of the tin. If you greased properly (there doesn't need to be much oil) then they should fall out pretty easily. Just place your cutting board over the top of the muffin tin, flip everything over, and tap the bottom firmly to help the puffs fall out. These will be delicious on their own, or you could serve them with something vanilla, like a thick vanilla coconut cream poured over the top (I will have to try that next time!). Have you ever made a meal, which you were fully planning on photographing for your blog’s show-and-tell later, but smelled so good when you finally got it out of the oven that you forgot to get the photo of it on a plate? Well, fortunately for me, this was so delicious that I will most definitely be making it again! I’ll get the artistic “plated” shot on the next go-round, hopefully. For now, we’ll make due with the shots I took as I was pulling it out of the oven. Chop the Sweet Potato in to 1/2 inch chunks, put it in a pot, cover with water, and boil. The more finely you can stand chopping the sweet potato, the less you will have to mash it later. With the 1/2 inch chunks, I found that just stirring it was enough to mash the sweet potato fully, and I didn’t use a potato masher at all. Also, to make this recipe slightly sweeter, you can peel the sweet potato – leave the peel on for the extra nutrients. As this is starting to heat up, add the coconut butter to the pot. Once the butter has melted, stir it in. While the sweet potato is cooking, dice the ginger finely, and add to the sweet potato. Most recipes will call for peeling the ginger. I have found that using ginger in this way will make the peel mostly irrelevant – since we’re going to add it to a boiling pot and cook it down with the sweet potato. So, dice the ginger as finely as you have patience for, and add it to the pot. 4 inches of ginger is a lot, so it may be easier to do 2 inches at a time, making the dicing easier. Let the pot boil down, stirring regularly, until there is no liquid left. The sweet potato should, at this point, be mostly mashed all by itself. If you elected to use larger chunks, or a little less water, then grab a potato masher and finish mashing. The final mash should have very little liquid in it. Let it cool on the stove-top for at least 10 minutes, until the mash is below 90 degrees (the temperature of the pot should be comfortable to touch). Start pre-heating the oven once the mash has boiled down and is cooling. Add the eggs. Either crack the eggs in to a mixing bowl to whisk separately, or add them directly to the sweet potato mash. 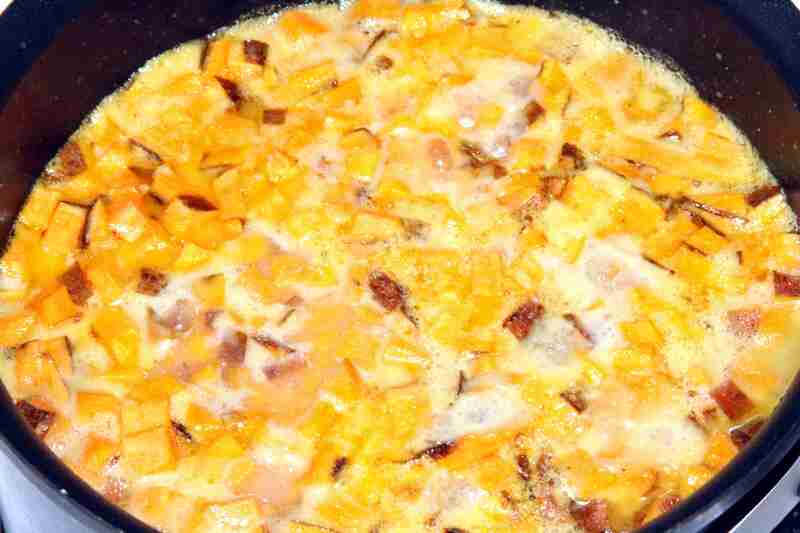 In either case, stir the eggs in to the sweet potato mash thoroughly. 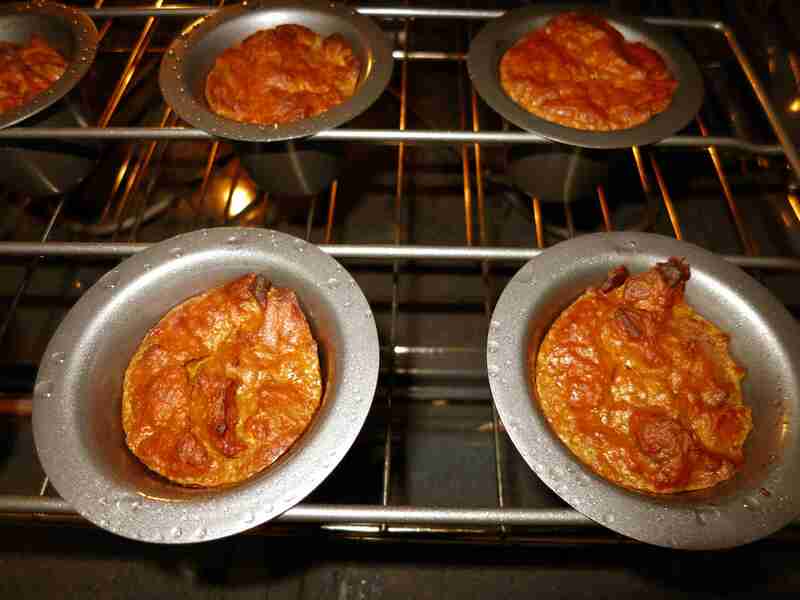 Using a bit of coconut oil, grease the muffin cups. Pour the final mixture in to the muffin tin. 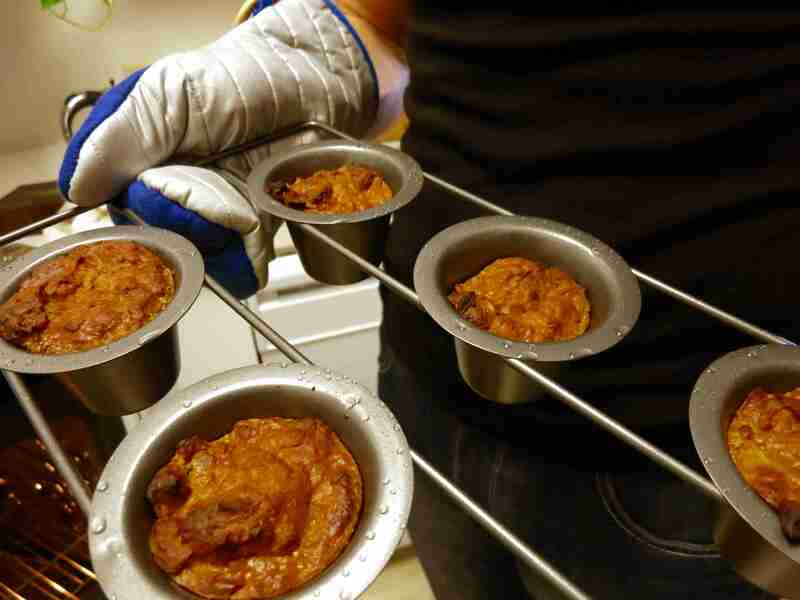 Put the tin on a middle-rack in the oven. As usual, do not fill to the top of the tin. Even though these contain no yeast, the egg will still expand during the baking. These are best served hot – piping hot! As with other baked confections – this will need to be “lifted” out of the tin. If you greased properly (there doesn’t need to be much oil) then they should fall out pretty easily. Just place your cutting board over the top of the muffin tin, flip everything over, and tap the bottom firmly to help the puffs fall out. These will be delicious on their own, or you could serve them with something vanilla, like a thick vanilla coconut cream poured over the top (I will have to try that next time!). And finally: Enjoy!! yes! I totally get so excited by some food experiments that I forget (or hasten) the photography. these look yummy! Thanks! It’s good to know that I’m not alone in this. On the plus side: I now know that I must re-make them, and soon, since I really need to put the completed photo up!! Wow, Lucas! These sound and look fantastic, and I’m thrilled to see a meatless paleo recipe from you. Can’t wait to try them! Thanks for the comment Shari – and I am so glad that you like them! I’ve been mulling this recipe over in my mind for months; getting the temp, timing, and ingredients all lined up can be an exciting challenge! And as for meatless recipes, you know I use a LOT of vegetables; just rarely all by themselves. I have a few others that have managed to come out completely meatless. I hope you enjoy them! Lucas, thanks so much for these recipes. Though I am starving now as a result. LOL! My pleasure!!! I am so glad you’re enjoying reading these! You could. Or you could just get carried along with some of your favorite online chefs, doing what they post… I really don’t mind if you go and try out all my recipes! I don’t spend much effort planning my workouts – I let the people online whom I follow do all that. Then I just do what they’re doing! I figure: I stick to my specialty, and people will enjoy it. I get my advice from people in their specialty. And it’s all a good trade! YUM!! I want now! 🙂 More proof that you’ll be a GREAT addition to the program! Can’t wait! Thanks Carl! I can’t wait either!! These look awesome! Where are you selling them exactly? And I hope to hear what you and Carl are hatching up. ← What do Macklemore and Paleo Have in Common?